More often than not the speaker systems in our laptops leave us wanting more, and there are times when wearing headphones is uncomfortable and simply won’t do. Yes, you could carry around a set of so called “portable” laptop speakers or a docking device, but often they’re heavy, require a large amount space, and need to be plugged in to a power supply. That’s where the Vibro Portable Vibration Speaker comes in handy. The Vibro Portable Vibration Speaker is a small and easy-to-carry mini speaker system that works with a wide array of devices and comes equipped with a module that lets you attatch it to pretty much anything — turning everyday objects into speakers. How does it work? 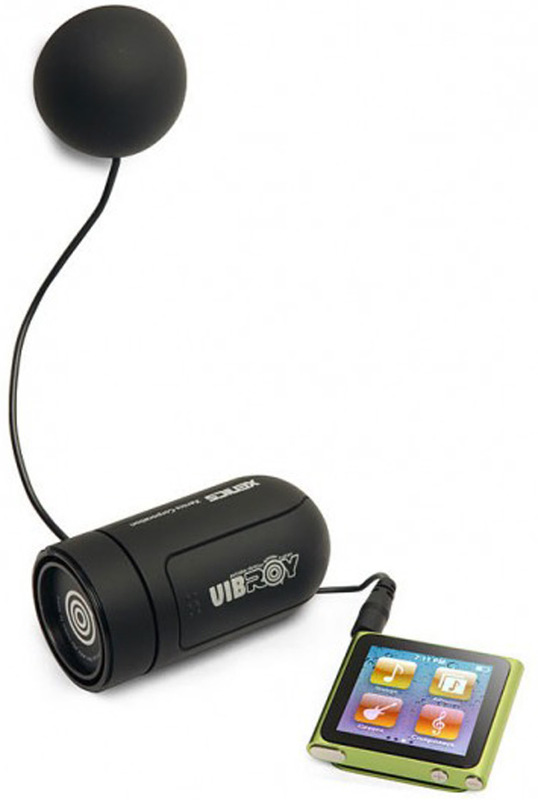 Well, depending on the size of the object you stick it to, and whether or not that object is hollow inside, the Vibro will vibrate that object and amplify sound creating a portable speaker from just about anything. Let’s say for example you had an empty milk carton on hand, you could attach the Vibroy to the carton and just like that you have a portable speaker with amplifier. No longer content with being glorified refrigerated poster boards for missing children, we can now add impromptu speakers to the list of uses for milk cartons thanks to the technical wizardry found within the Vibro Portable Vibrating Speaker. 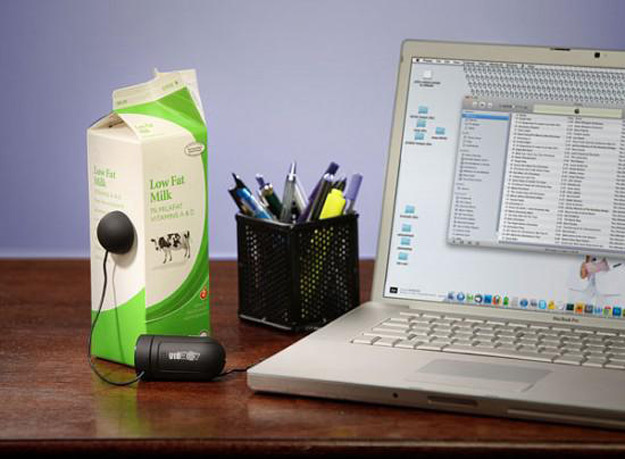 Of course a milk carton sealed and full of milk probably won’t amplify sound as well as one that is open and empty, but it gives you an idea on what types of everyday items you could use. What makes the Vibro so great is that it’s portable and easy to use, simply stick it to whatever you have on hand and let the music play. The device comes with a 3.5mm audio jack and features a 1Watt output, 300Hz – 10 KHz frequency response, 40ohm impedance and noise level of 78dB. What’s even better is the Vibro can churn out over 10 hours of playback on 2 AAA batteries, and also works with a standard USB cable. For $29.99 it’s certainly a steal and might make a great stocking-stuffer this holiday season.